We are looking to move from the presence of God into His glory. Search me thoroughly, O God, and know my heart; Try me and know my anxious thoughts; And see if there be any hurtful way in me, And lead me in the everlasting way (Psalm 139:23-24). It may become very uncomfortable as He starts to show us these things, but it is all part of the process. The Bible describes our lives as trees: oaks of righteousness (Isa 61), trees planted by the river of life (Ps 1). What kind of fruit is on our tree? Is it the fruit of righteousness, or the fruit of rejection, fear, anxiety, worry, depression, addictions and so on? All those negative things are just fruit, and certainly God wants to address them. But if we are to be free of that fruit, we need first to deal with the roots which produce it in our lives. There may even be a tap-root in our generational line which goes deeper still. See to it that no one comes short of the grace of God; that no root of bitterness springing up causes trouble, and by it many be defiled (Heb 12:15). Doing things in our own strength can cause us to come short of the grace of God (His divine enabling ability and power), and that bitter root can spring up and cause all kinds of trouble and defilement. The soil of insecurity provides the perfect medium for those roots to grow. In the soil of insecurity, seeds of offence grow into roots of bitterness and produce the fruit of resentment. The soil of insecurity arises because of a lack of love, acceptance, affirmation, approval or encouragement in our upbringing: we all have an insecure soil to some extent. Seeds of offence may be sin, or things said or done – or indeed things not said or done – sown into that insecure soil. At that point we have an opportunity to deal with it before it has a chance to take root. If, instead of removing the seed straight away, we leave it to germinate, then it quickly sends down those roots. 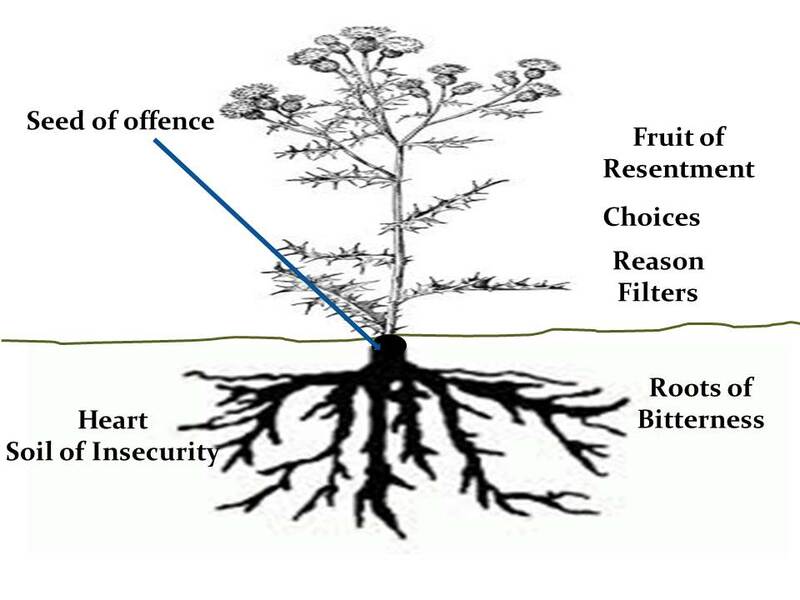 The roots in our lives are the things that we think and feel, our responses, emotions and attitudes which develop as a result of tolerating that seed of offence sown into insecure soil. Then eventually, the tree will grow up and produce fruit: the things we say and the things we do, our behaviour, all as a result of the roots which have developed. When we see something happening on the surface, it is an indication that there are things going on underneath that we need to deal with. For example, if we begin to nurture anger because of what someone has done, that will trigger a response in our subconscious mind. We will begin to say and do things out of the roots of bitterness, producing the fruit of resentment. Reason filters kick in, distorting our view of everything, feeding our anger and resentment and causing us to make poor choices. If someone rejects us, seeds of rejection are sown into our life. A root develops because of the hurt and pain, and produces the fruit of protection. That may take the form of rejecting others first and becoming prickly, or doing the opposite and becoming a doormat, accommodating people and being overly compliant, making sure we never do anything to cause anyone to reject us. Still, we feel rejected even when we are not actually being rejected, because we see through that filter. Injustice may be a seed of offence: ‘it’s not fair’. Life does not always treat us well. If we allow roots of self-pity (‘poor me’) or self-hatred (I deserve it) to develop, it produces the fruit of depression, anger turned in on ourselves. And a victim mentality creates an environment in which unfair things happen. When lack, poverty and deprivation are the seed of offence, the root of independence may develop, producing the fruit of self-sufficiency on the one hand and a lack of generosity on the other. Or a root of hopelessness, producing the fruit of failure. One I found operating in me was the seed of false accusation. That produced the roots of pride (‘I’m in the right’) and the fruit of self-righteousness. In all these cases, very often we simply try to remove the fruit, to change our behaviour. Every time we cut down the fruit, though, it keeps growing back. One day, we might realise that we need to deal with the roots, but even the roots keep growing back. We have to deal first with the original seed of offence. As long as it remains in place, attacking the fruit or the root will not have lasting success. Once the seed of offence is dealt with, we can remove the fruit and the roots without them growing back. This works for our own lives, and even for the roots of iniquity in our past generations. Joff Day taught us the principles of ‘Forgive and Release’ at Freedom back in the early ’90s, and it has become our foundational understanding of how these things work. We forgive whoever offended us (or our ancestor), and release them from the debt they owe us (the negative results of what they did). That deals with the seed of offence. Then we repent of the roots of bitterness, of our emotional response to the situation, and we renounce the fruit. Because the seed and roots are dealt with, we can actually change the way we behave. The problem is that if we stop there we still have that heart soil of insecurity. If more seed is sown, it will find a perfect growing medium. We change the nature of the soil of our heart by digging in the revelation of who we are, our identity, the truth of who we are and who God is. We confess the truth. God meets our needs for affirmation, love and acceptance. We know we are loved and accepted in Him. As a result of that, we can put down new roots: a tree of righteousness, planted by a river of living water, with roots drawing from the life of God. Then we will produce the fruit of righteousness. Transformation 20-part audio series with slides (this post has been drawn from Mike’s notes for session 7). LieBusters (book and ebook by Jonathan Cavan – see also liebusters.org). Jonathan taught LieBusting at Freedom earlier this year and we have found it to be a really effective tool for identifying and breaking off the lies of the enemy, helping us claim our true inheritance and fulfil our destiny as sons and daughters of God. (UK link for the book: LieBusters). This gave me more insights on dealing with the deepest things in my life. Love the illustration of the tree. God Bless You.